A novel 1920s breakdown recovery trailer. Homepage. This page: A handy invention to aid the moving of a car that has no wheels, by the Eagle Engineering Co. The Eagle patented recovery trailer. Many a designer has exercised his or her grey matter over the problem of how to move a stricken car. A huge variety of trailers, towing dollies, poles, ropes and other items of equipment have been produced to solve this problem, and the Eagle Engineering Company Ltd, of the Eagle Works in Warwick, were one of the leading manufacturers of such recovery equipment for many years, either side of WW2. In addition, they made many other un-related products throughout their history, from oil engines to wireless sets of all things (the "Chakophone" range), from what is now a listed building in the town. The four-storey red-brick building is also referred to as the Eagle Warehouse. 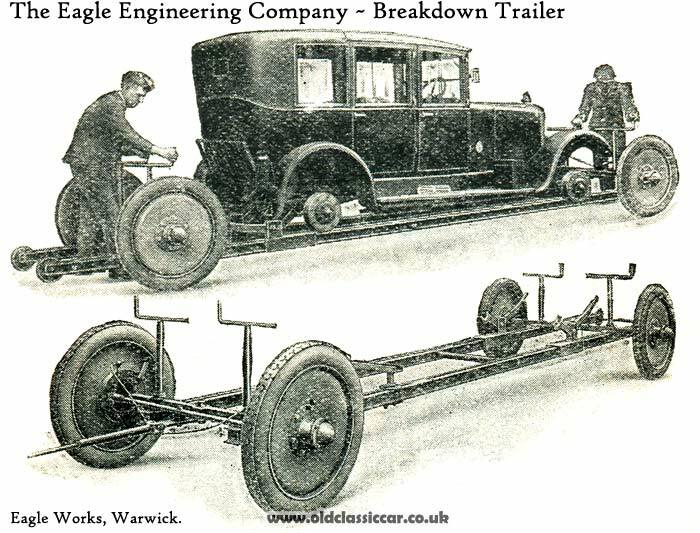 The reference I found to the Eagle Breakdown Trailer dates to the late 1920s, and was designed as an alternative to the more commonly-encountered breakdown trucks, fitted with cranes produced by firms such as Harvey Frost etc. "A breakdown trailer with automatic brakes and special towing tackle. Will remove safely a car in any condition even if all wheels are off. Load can be towed at any speed." Return to the gadgets, tools & accessories pages at oldclassiccar. In this section you'll also find details of Harvey Frost recovery trailers of the 1960s/1970s: link.